Let’s say you need to find a dog groomer, florist, or coffee shop in your area. What’s the first step you’d take? If you’d hop on Google, you’re like the majority of American shoppers. Because online search engines have become such a major resource for those of us looking to make purchases, it’s more important than ever that companies have a strong online presence. This shift towards using the Internet to make purchases spells bad news for more traditional resources, such as the phone book. And if you’re a business owner who still relies heavily on the phone book to get the word out, it’s time to consider incorporating online marketing efforts into your strategy. 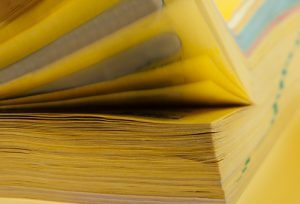 Before the Internet era, the phone book was a major resource for people looking to find service providers in their area. However, instead of spending time flipping through this massive book, people can now type in what they’re looking for into an online search bar and within a matter of seconds get hundreds, if not thousands, of relevant results. Not only that, but they’re also able to read reviews about these businesses, which can help them to make the best use of their money. Because this method has become so popular, it’s important for businesses to respond accordingly. Develop your website: Be sure that your company’s website is up-to-date. It should look clean and crisp, and should include relevant information about your brand. If people head to your business’s website and find an outdated, confusing site, they’ll quickly move on to another option. Your site should also be mobile friendly, since many people do their browsing on their phones or tablets. Get active on social media: Your customers and potential customers are spending a large chunk of their free time on social media platforms like Twitter and Facebook. In order to reach them, you’ll want to stay active on these sites too. You may even consider using paid advertising options on social media to make more of an impact. Consider utilizing Google Ads: Programs like Google AdWords let you reach potential new customers who are browsing the web trying to find businesses like yours. You can set the amount you spend, so there’s a plan that works for every budget. Another way to make your brand stand out online is by providing valuable information to customers and potential customers in the form of a company blog. When people find your site after doing research online, they’ll get to read thoughts that come directly from your team. This information helps to separate your company from other similar businesses, further establishing your brand as a superior presence in your industry. Even one post a month is a good way to give your business an extra “oomph” online.